Do you know your farmer? Your investor? Do they care about your well-being? People are hungry for meaningful relationships and top-quality local products and food. Clearly, many modern Americans have been suffering and impoverished from a lack of connection, but in the last decade we have seen a significant interest in supporting locally owned, value-driven businesses. 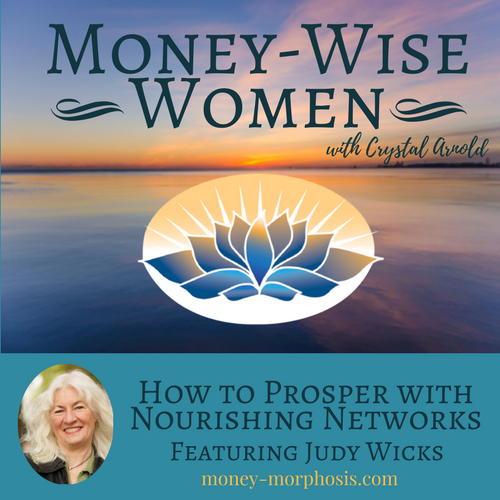 “Money-Wise Women” guest Judy Wicks has pioneered many endeavors to create social change through wise business practices. Most recently, her book Good Morning, Beautiful Business won the 2015 Nautilus Book Award in Business Leadership. As a social innovator, she cultivates more vibrant local economies around the country. Judy is a natural networker, and quality relationships have motivated endeavors. In the 1980s, she was a pioneer in the farm-to-table movement with her White Dog Cafe in Philadelphia, PA. She began sourcing local and organic food and humanely raised meats for her restaurant. She compiled a list of vetted vendors of ingredients so her menu was aligned with her values. She originally thought this values-based approach to food could be her competitive advantage. She created greater intimacy between producers and consumers—for instance, bringing farmers in to meet customers at a special “Dance of the Ripe Tomatoes.” Her business flourished, and she became a leader in an emerging movement to align money with values and engage with the local economy. Finding belonging within a mutually supportive community network is important to cultivating true wealth. It is a liberating and revolutionary act to make value visible. This is the heart of healing needed now for the economy. It is significant not only because it unleashes the individual potential, but also because it reveals new ways to steward common resources. In 2001, Judy co-founded the Business Alliance for a Local Living Economies (BALLE), which is an organization that catalyzes the emergence of a new economy. With over one hundred member organizations, this network serves to identify and connect pioneering leaders, spread solutions, and attract investment toward local economies. American small businesses represent the third largest world economy, with annual sales of $8.6 trillion and 51% of the U.S. gross domestic product. Judy is also passionate about intergenerational exchange. Nearly seventy years old, she is passionate about supporting the emerging generations with the Circle of Aunts & Uncles project she initiated. This network offers local entrepreneurs a new vehicle for accessing local lenders offering low-interest loans, as well as advice, business, and connections. The Circle creates trusting relationships between lenders and borrowers, enabling investors to understand the true needs of the business and to provide advice and contacts. Thirty-five of the aunts and uncles each put up $2,000 and offer a variety of expertise. This more intimate approach is the opposite of predatory lending. Creating visibility in the economy unlocks collective potential. Modern financial exchanges are often hidden because of guilt and shame. Extractive behavior dwells in the shadows. Without accurate information and open conversations, citizens are crippled in the ability to discern what is wise management of resources, individually and collectively. Judy is a pioneer and has created a legacy of true wealth through her work with ethical business and local living economies. Judy Wicks is an author, activist, and entrepreneur. She founded Philadelphia’s iconic White Dog Cafe in 1983, which became a pioneer in the farm-to-table movement and a model in sustainable business practices. She is founder of Fair Food Philly (2000) and the Sustainable Business Network of Greater Philadelphia (2001) and the nationwide Business Alliance for Local Living Economies (BALLE) (2001). In her retail career, Judy founded Black Cat, which featured locally made and fair-trade gifts for twenty years. In 1970, Judy cofounded the original Free People’s Store, now well known as Urban Outfitters (no longer affiliated). Good Morning, Beautiful Business, Judy’s acclaimed memoir, won a national gold medal for business leadership and has been translated into Chinese and Korean. Judy continues her work to build a new economy of beautiful businesses, and she mentors the next generation of entrepreneurs in Philadelphia and beyond. More at www.judywicks.com.